Last week, right in the middle of the week, we took a day off. Matt needed it, I needed it, the boys needed it. We didn’t even pack food like we usually do. When we decided it would be a day off, we meant day off. 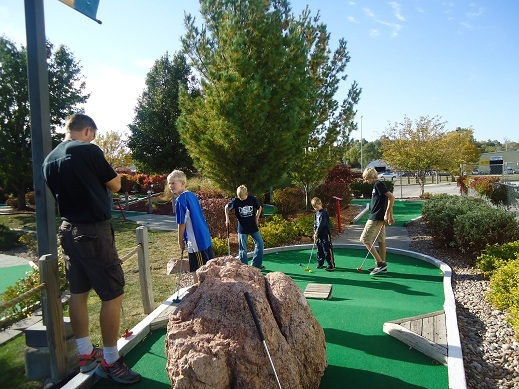 We had a long, leisurely lunch at Olive Garden, did a little shoe shopping at the mall, and then, because it was a beautiful fall day, we went to play a little putt-putt. All six of us had a blast. In case you were wondering, no, I didn’t win. Shocking, I know. 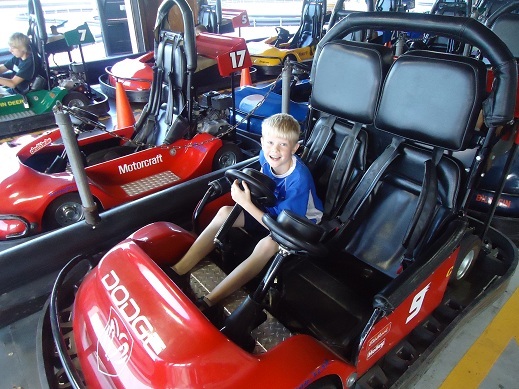 While at this family fun center, we also engaged in a family go-cart race. In case you were wondering, no, I didn’t win that either. Shocking, I know. We came home refreshed and ready to get back to work. I’m so thankful God blessed us with this time away to close the computer, close the books, put away the soccer balls and just enjoy each other. I spent two days with my dad last week in the hospital. We thought he was going to die. This post I linked up are my thoughts on appreciating others while they are alive. Days off are the best! After wearing myself out this weekend, I took a day off and a day in on this cold, rainy day. Baby number five *loved* the stillness and was more active than usual in my womb. It was a sweet day. I never “win” either, but having the day off is enough of a prize for me! That sounds like a wonderfully fun day! We had a similar day this past year when the local Autism Society had a free outing for us @ a local go cart and mini golf place. This year, sadly, they didn’t notify by email and we missed it. Maybe we’ll need to look for coupons and take our kids on our own. Thanks for sharing! Thanks for the timely reminder that we need to play sometimes! Those are the best days. Where everyone is relaxed and focused on each other and fun. Glad you had a good time! I love days like that, just enjoying one another’s company and having fun. 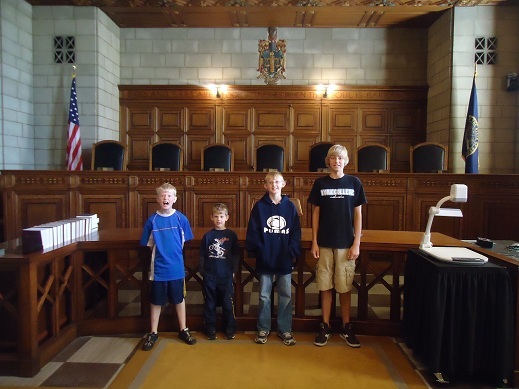 With 4 boys, I don’t think there is such a thing as a “NORMAL” picture!!! I have one boy and I don’t have normal either!!! You sure did have a great day!!! I LOVE your posts!! They are funny and down to earth and it also helps for all of us to realize that we aren’t the only ones that have trying or unusual days!! Thanks Laura!! I can’t wait for my Tuesday off which is Oct. 25th!!! Maybe I’ll take my son somewhere!!! Opps! I accidentally left 2 links since I left my name instead of the post name. Sorry! Looks like your family had a great “day off.” We all need to do that more often! Thanks for the inspiration. Thank you for reminding us to be thankful each week! Thanks for letting us share our gratitude each week! can get back to loving life and loving her kids. She has been so remarkable through this journey. Her faith has not waivered. She is the strongest woman I know and I am so blessed and thankful that I have been able to be touched by her and her FAITH. Wonderful!! Some days you just need a break from the routine. So glad you were able to take a day off. these days of rest and togetherness are so important! May you enjoy many more days like this. thanks for sharing what you’re thankful for and for allowing us to share as well! love your blog! Love it. We all need a day off once in awhile and looks like a blast. Yea! It is so important to take a day off occasionally! Even with the food. Glad you had fun! That’s what being a family is all about! I cannot believe how GOOD God has been to our family. On this Gratituesday, I am thankful for God’s leading. Looking forward to the days when my kids will be old enough to do that kind of stuff! I am thankful to God for watching over my husband and three other men this weekend when they were involved in a car crash with a train. I know that God was with them because the car was tossed into the air and back down. It was very frightening. I thank God everyday for the blessings he has bestowed upon me and family.